On December 10, 2018, U.S. Food and Drug Administration (FDA) granted clearance for reSET-OTM, a digital therapeutic app created by Sandoz, a division of Novartis, and Pear Therapeutics. This prescription-only mHealth (mobile health) app help increase retention (the amount of time a patient participates) in an outpatient treatment program for individuals with opioid use disorder (OUD). 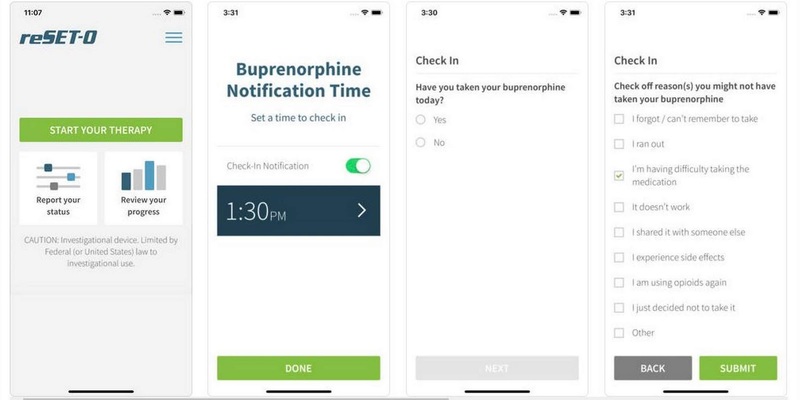 The app provides cognitive behavioral therapy to complement outpatient therapy that includes transmucosal buprenorphine (medication-assisted-treatment) and contingency management for adult patients 18 years or older who are under the supervision of a clinician. "As part of our efforts to address the misuse and abuse of opioids, we’re especially focused on new tools and therapies that can help more people with opioid use disorder successfully treat their addiction. Medical devices, including digital health devices like mobile medical apps, have the potential to play a unique and important role in contributing to these treatment efforts. That’s why, for example, we launched an innovation challenge earlier this year to promote the development of medical devices that could help treat addiction," said FDA Commissioner Scott Gottlieb, M.D. He further added, "Often on the road to recovery, patients find their commitment to staying in treatment may wane. Providing Americans suffering from OUD with more options and proper support to address treatment challenges is key to helping them succeed. We know medication-assisted treatment works and we support novel ways to keep individuals more engaged in their treatment programs and to provide clinicians with new ways to intervene to help them remain in treatment." "Nearly 50,000 drug overdose deaths involving opioids, including prescription pain medications and heroin, took place in the U.S. in 2017," said Corey McCann, M.D., Ph.D., President and CEO of Pear Therapeutics. "There is an urgent need for new and innovative therapeutics to address this public health epidemic. This groundbreaking decision by the FDA ushers in a new standard for treating patients with OUD and it signals a new path for therapeutic software to be used in conjunction with pharmacotherapy to improve efficacy." The app can be downloaded directly to a patient’s mobile device (currently available at Apple Appstore only) after they receive a prescription to do so from their doctor. It is intended to be used while participating in an outpatient OUD treatment program. It can serve as a training, monitoring and reminder tool for health care providers and patients in maintaining an outpatient treatment program. It includes a compliance reward system (i.e, gamified approach) – such as earning special icons on a prize wheel within the app. The app is not intended to be used as a stand-alone therapy, as a substitute for medication, or for patients whose primary language is not English.